Now the weather’s getting warmer, it’s time to get outside and play. Our Whai Mai book is an ideal playground companion. It includes vocabulary for the playground equipment as well as the directional words such as going up, coming down, back, forward, in, out, crossing over and coming back. Children love taking the ideas from this book straight out into the playground. One mum emailed us to say that straight after reading Whai Mai for the first time, her children wanted to go outside and sing the song as they played. Sadly, it was raining that day, so the children went through the book again instead. Whai Mai means “follow me” or “copy me”, so it’s also an excellent phrase to add to your kete of te reo words to use during play. 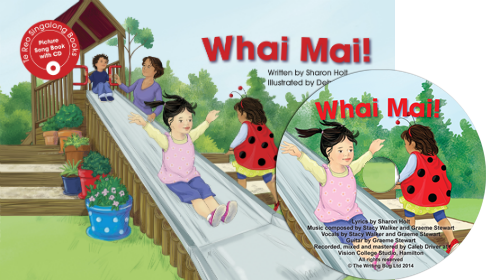 It’s even possible to use “whai mai” as a follow the leader or Simon Says game in te reo Māori. The Whai Mai song lends itself to the children incorporating te reo Māori phrases during their play on the slide, swings, tunnel and bridge. And the catchy tune makes it easy for teachers and parents to encourage children to sing during their time in the playground – making the learning easy. While climbing to the top of the slide, children can sing “piki ake” for “climb up”. They can add ” heke iho” as they slide down again. For the swings, it’s easy to swing forward with “ki mua” and backward with “ki muri”. The phrases for the tunnel are a little longer, but will be mastered with practise: going in “kuhu ki roto” and coming out “puta ki waho”. For the bridge, children will enjoy singing “whiti atu” as they go over the bridge and “hoki mai” as they come back again. Like all good playground experiences, this book ends with kai time!